There are many areas within warehouses that are constantly being underutilized. The two we come across the most: bulk storage areas and the cooler/freezer. These areas consist of product being stored in high volume with low SKU’s, usually being stacked on top of one another with similar sized pallets. Cold storage space is at a premium; designing and building an entire new room for these applications is an option, a very time consuming and costly one at that. Solutions are available that can Increase pallet storage immensely without knocking down or constructing new walls. Drive in Rack utilizes vertical clearance and depth to maximize cubic space. A drive in rack system can massively increase pallet storage space by up to 75% more than standard selective rack or floorstack. A drive in system is made of (depending on pallet weights and dimensions) heavy duty structural or roll formed racking. The system implements the use of depth and vertical clearance to reduce storage footprint while increasing available pallet positions. Pallets are stored back to back in typical depths of 5 to 15 pallets deep. 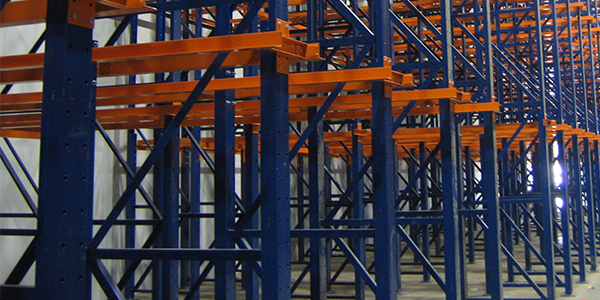 Drive in racking is a viable solution when high density is needed rather than selectivity. The system can be configured as a LIFO (Last-in,First-out) or FIFO (First-in, First-out). The majority of the systems are placed against a wall so LIFO picking is mostly used. Storing product from a drive in system requires lift truck operators to physically drive into the system and place products on the rails. This picking strategy increases the chances of operator error and the possibility of colliding with the rack which can cause damage to the structure, product damage or bodily harm. Picking within a drive in system becomes a very time consuming process due to the fact that the operator has to pick and move every pallet in front of the target pallet, thus decreasing productivity and increasing the mileage put on lift trucks. When picking on higher levels, the operator will have to unload all the lower levels of the drive in system first to even access the pallets on the top levels. The deeper a system is, increases the chances of a collision. The possibility of being damaged more frequently then selective rack requires frequent damage checks to be done to maintain structural integrity. Lift truck operators have to use extreme caution when working within these systems to ensure their safety. A new drive in system an cost roughly $150 per pallet position the system increases pallet storage capacity, decreases footprint while taking pallets off the floor, but there are other costs: selectivity and productivity. racking do to the safety of the operator, Pallet Shuttle can be built as deep as needed because the shuttle does all the picking. 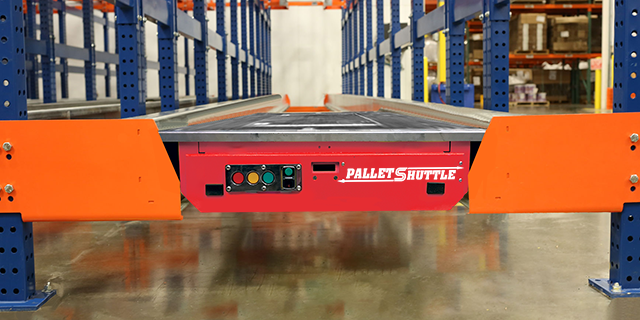 Storing pallets with Pallet Shuttle is done in a few simple steps: Lift truck places Pallet Shuttle on the rails of the row intended for pallet to be stored. The truck places the loaded pallet over the shuttle. Pallet Shuttle lifts the pallet, then transports the pallet safely and swiftly to the correct location. Pallet Shuttle returns to the end to store the next pallet that the lift truck has placed on the rails to be stored. Retrieval of the pallets consist of the storing steps carried out in reverse. 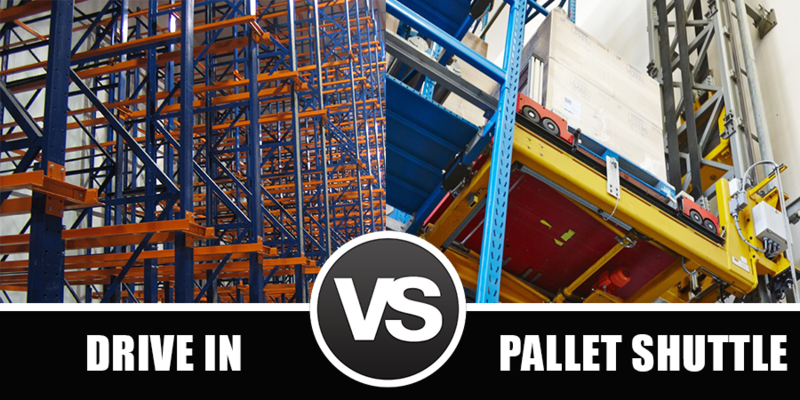 In a drive in system, the pallets on the lower level must be removed to access products stored on the higher levels to allow a lift truck to drive in. The ability to access product from any aisle of the system increases pick productivity and reduces the chance of a collision within the racking as well as product tipping or damage due to operator error. The semi-automated picking and retrieval of pallets with Pallet Shuttle improves throughput in areas that need to utilize a deep rack system. [/vc_column_text][vc_column_text]The battery in Pallet Shuttle system is very energy efficient allowing it to be utilized in LEED certified warehouses as well as reducing mileage on lift trucks helping to conserve further energy. The system cuts labor costs by implementing automation in the picking process making it more streamlined. The lift option adds automation and reduces the usage of lift trucks. In cold storage applications the reduced usage of lift trucks within a freezer can dramatically reduce energy consumption. Average lift trucks operating in a cooler of freezer application can lose up to 50% of battery charge and life cycle due to the temperature. 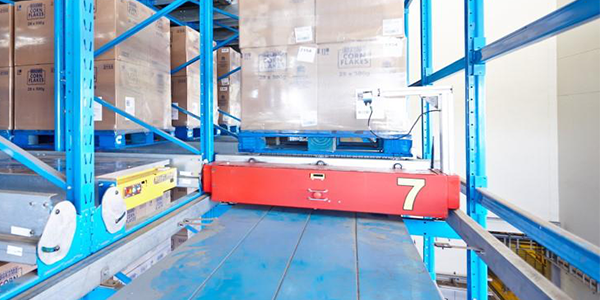 The use of an deep lane storage system such as Pallet Shuttle reduces the need to have multiple trucks operating within a freezer. The Shuttle system contains a high powered Lithium battery that gives it the ability to operate seamlessly in temperatures as low as -22C. The Pallet Shuttle system is scale-able with the ability to add features to create a fully automated system with the implementation of a vertical lift, eliminating the need for lift trucks to place the shuttle in the correct row. The fully automated option also allows the rack structure to be extended vertically to increase storage capacity. At around $250 per pallet position, the solution provides increased storage capacity, reduced labor/energy costs, scale-ability and flexibility. The economy is volatile, which requires supply chains to have the ability to quickly adapt to the market. Shouldn’t a storage solution be just as nimble?